There is nothing like the feeling when you attend a professional development session that opens your eyes to something new and exciting. Even better if it is something new that you can apply back in your library. In our humble opinion, there is no better way to stay motivated on the job than constantly learning something new. But when to find the time to learn something new? Conferences can get expensive and the timing could conflict with your availability schedule. Have no fear! There are many online options which you can do on your own time! Here are a few of our favorite places to go for Professional Development! We have to give props to Wyoming State Library. They collect all online training and share it in a very convenient calendar. Find something you want to learn about but you can't attend the session? Most say to sign up anyway and they'll email you a link to the archived video. If Wyoming's calendar is overwhelming to you, Webjunction is the place to visit. They take these events and divide them by category. They also provide FREE self paced courses and webinars (upcoming and archived past videos) to all library workers and volunteers. If you have patrons that speak a language you don't know, it may be helpful to use your library's language programs (Mango or Transparent tend to be the most popular). If the library you work in doesn't have these programs, check your home town library or your state library. The language programs may also have quick guides to help library professionals, like Transparent's Survival Spanish for Librarians. There are many other fee online courses if you start look by subject instead of profession. What do you want to learn more about? Google Analytics? Social Media Tips? Photography? 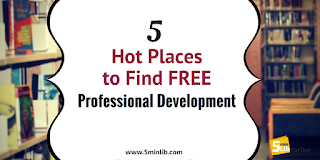 There are free courses for them all! So, there are endless places to learn. The question now is what time are you going to carve out of your calendar to learn something new?